Tickets are available to book from Friday 13th June 2019. Now famous for their high-speed high-quality speedboat sightseeing adventures, Thames Rockets 'Ultimate London Adventure' is the bucket list trip everyone visiting London is experiencing. Step aboard at the world famous London Eye Pier on an adventure that has taken TripAdvisor by storm - a 50 minute whizz that will have you wide-eyed with awe and adrenaline in equal measure. Our witty guides are on hand to ensure you see what needs to be seen along the mighty river Thames, taking in all the sights with the high class banter that has become a trademark of the Thames Rockets experience. Once past Tower Bridge it's time to hold on tight and turn up the volume as we propel you around Canary Wharf at 30 knots (35mph! ), twisting and turning, laughing and whooping as you bounce over the wake and carve your way through the docklands. Our classic medley accompanies your adrenaline rush this is London as you've never seen it before. As if that wasn't enough excitement for one day, your next stop is sure to make your hair stand on end! Take a ride on the biggest, fastest city zip wire in the world in Archbishop's Park this summer. Prepare to climb to heights of 35m (more than 9 double decker buses), where you'll take off for an exhilarating 225m ride at speeds of up to 50 mph. While you're at the top you can take in some incredible views of the iconic London skyline, including the House of Commons, The London Eye, the Shard, and Westminster Abbey. You won't want to miss out on this once-in-a-lifetime adventure in the heart of the capital! Please note it is the passengers responsibility to travel between each attraction, approximately a 10 minute walk. Zip Now London operates until Thursday 12th September 2019. We did just the first day we were in London. We should’ve done this every day in London as it’s the best thing we’ve done so far after four days in London. It was an absolute blast! My two boys (7&5) found this absolutely thrilling, and so did I. 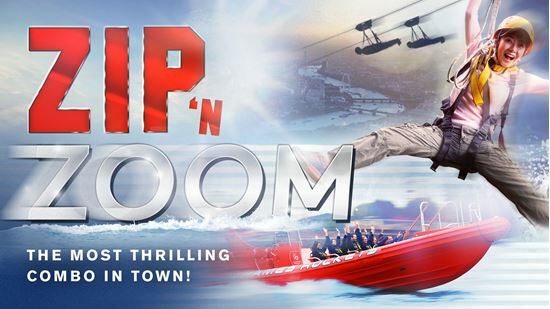 Great views of London, great guides (interesting facts, good banter)… but the real reason to book is the sheer joy of speeding turns, bouncing on the waves and the wind in your hair to a cracking soundtrack! We loved the fact that it was equal parts speedy craziness (the boat really rockets down the Thames) AND fun, historical facts about London's landmarks. Our guide Stacey was excellent - she gave the 'tour part' the perfect balance of comedy vs history. Highly recommend!